Easter doesn’t quite have the culinary reputation holidays like Christmas or Thanksgiving enjoy. Maybe it’s the season or the lack of a clear meal tradition, but it’s easy to expect you’ll be eating a whole lot of candy and a plate full of ham. But if you’re having people over, you’re going to have to do better than that! We’ve got some recipes that will help you put together a lovely holiday meal, complete with seasonal vegetables, non-ham meat, and some delightful desserts — plus, they’re all relatively easy! Whether you’re serving dinner or brunch, or another midday meal, here are some ideas sure to make mouths water. We’ve got a range of ideas, from a simple egg dish to a more challenging lamb roast. A lighter alternative to the traditional Easter ham, or the perfect dinner companion, this salmon recipe is relatively quick and is sure to please all palates, both young and old. We’ve skipped the cheese in this version of the pesto sauce to complement the fish better. First, preheat the oven to 400 degrees. Coat a large baking sheet with olive oil and place scallions on the sheet, coating with a little olive oil, plus salt and pepper. Add salmon to the sheet on top of the scallions and drizzle with an additional two tablespoons of olive oil. While the salmon is baking, combine basil, nuts, salt, pepper and the remaining olive oil in a food processor until all ingredients have been thoroughly blended into a smooth puree. Remove the salmon from the oven and transfer to a serving dish. Top with pesto sauce and serve with lemons for garnish. Lamb is a tender and flavorful meat that’s just perfect for spring! We’ve opted to keep things simple, serving our version with a touch of apricot mint glaze. You’ll need a roasting pan as well as a sharp knife and some plastic wrap, but trust us — making lamb is much easier than you might imagine. 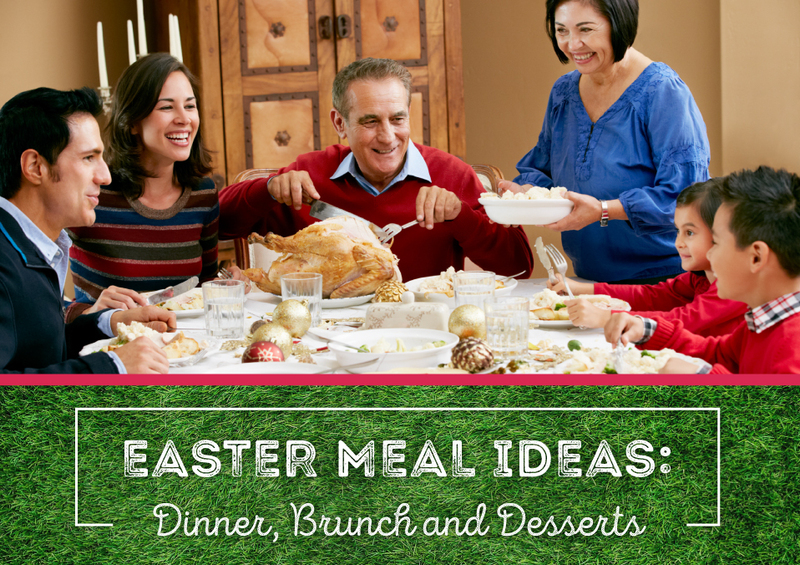 Serve with seasonal veggies or a simple side of mashed potatoes, and voila — it’s Easter dinner. In a mixing bowl, combine mint, salt, pepper, olive oil, vinegar, garlic and jelly. Whisk together until thoroughly blended and coat the lamb evenly with the glaze. Wrap in plastic wrap and place in the refrigerator for a minimum of 2-3 hours. When you’re ready to start cooking, let the lamb sit at room temperature for about 45 minutes. In the meantime, preheat the oven to 400 degrees and place the lamb in a roasting pan with onions surrounding the meat. Put the pan in the oven and let the lamb roast for 20 minutes, reducing heat to 350 degrees. Cook for about an hour, turning the meat with tongs every 15-20 minutes. An hour should be plenty of time for medium doneness. You’ll just want to make sure the internal temperature of the lamb has reached 135 degrees before serving. If you prefer your roast to be more well-done, leave in the oven for longer. Remove from heat and cover with aluminum foil. Let sit for about 15 minutes before carving. Gather any juice from the pan, pour into a bowl and skim the fat. Cut the lamb and transfer to a serving platter with onions. Pour juices over the top and serve. It’s not Easter without a little egg action! Kids and adults alike will love this veggie-filled egg bake, punctuated with little bits of bacon and, of course, some cheddar cheese. Preheat the oven to 350 degrees. Coat a large rectangular baking dish with non-stick cooking spray. In a large mixing bowl, whisk together flour, eggs, salt, baking powder and oil. Layer bacon, asparagus, cheese, green onions, tomatoes and mushrooms in the baking dish, then pour egg mixture over the top. Place in the oven for 35 minutes, or until eggs have set. Whether you’ve decided to serve, ham, lamb, salmon or something completely different, you’ll need some solid sides to round out the meal. Here are a few crowd-pleasing dishes that will provide some much-needed relief from chocolate overload or too many jelly beans and dyed eggs. Maybe not the healthiest choice, but your guests will nonetheless be quite excited to see these delightful spring veggies tossed in butter and a little cheese! Preheat your oven to 400 degrees. Meanwhile, melt the butter in a large skillet. Add onions and Brussels sprouts to the butter and season with salt. Cook until sprouts have become tender, which should take roughly ten minutes. Transfer Brussels sprouts to a large baking dish and add the bacon and peppercorns. Top with Parmesan cheese and place in the oven. Cook for 15 minutes and remove from heat. A fresh complement to any meat you choose to serve, we’ve opted to give these green beans a pop of zesty apple cider vinegar as well as a little bit of heat. Who said salads have to be boring? We’re lightening up for spring with fresh veggies that’ll give you some much-needed relief from one too many chocolate eggs. Fill a large pot with water and bring to a boil. Add green beans and sprinkle some salt into the pot. Cook for about three minutes, or until beans have become tender. Drain. Rinse with cold water, then set aside. In a separate mixing bowl, add lemon juice, vinegar, onions, pepper, hot sauce and tomatoes. Let stand for about 10 minutes and give the mixture a stir every couple of minutes. Stir in the green beans and basil. Mix until thoroughly blended, then place in the refrigerator until it’s time to serve. Easter and asparagus aren’t two concepts you’d necessarily link together, but there’s no better time to take advantage of the bounty of the season. Here’s a relatively straightforward recipe that’ll go with any brunch, lunch or dinner. In a large skillet, heat olive oil over medium heat. Add almonds, shallot and minced garlic, and cook in the olive oil for two minutes. Add the asparagus to the skillet with salt and pepper. Cook for about 5-8 minutes, or until asparagus turns a bright shade of green and is tender, yet crisp. Keep the bunnies happy with this sweet and savory carrot dish! Topped with honey and brown sugar and peppered with lightly spicy radishes, this simple side is easy to make, but bursting with flavor. In a large saucepan, fill with 1-2 inches of water. Add carrots and bring to a boil. Reduce to medium heat and cover the pan. Cook for 10 minutes. Add olive oil to a skillet and stir in honey, orange juice, garlic, cayenne pepper, brown sugar. Stir together until glaze begins to thicken. Add radishes and carrots, and coat evenly with the glaze. Cook for another two minutes and transfer to a serving dish. Skip the jelly beans and chocolate bunnies — we’ve got some Easter dessert ideas that’ll help you finish off this holiday meal on the right note. We’re thinking fresh fruit, a hint of chocolate or some lighter pastries that perfectly balance out a hot cup of coffee. While lemons are usually the citrus of choice for desserts, why not shake things up and add some sweet, tart grapefruit to your baked goods? Here’s an easy cookie recipe that’s perfect for Easter dessert. In a large mixing bowl, beat sugar, one tablespoon of the grapefruit juice and butter together with an electric mixer until ingredients appear fluffy. Add eggs and salt and then beat again until blended. Fold in flour, but only blend until all flour is evenly distributed, being careful not to over-work. Shape dough into two log shapes, wrap in wax paper and refrigerate for 30 minutes to an hour. In the meantime, heat the oven to 350 degrees and grease baking sheets with non-stick cooking spray. Slice logs into small pieces, about a half-inch thick. Bake for 15-20 minutes or until the edges of the cookies have turned golden brown. Remove from heat and set aside. In a small mixing bowl, whisk together the remaining juice, citrus zest and powdered sugar until it turns into a viscous icing. The mixture should be thick but still pourable. Dip each cookie into the glaze and set on a clean baking sheet until dry. 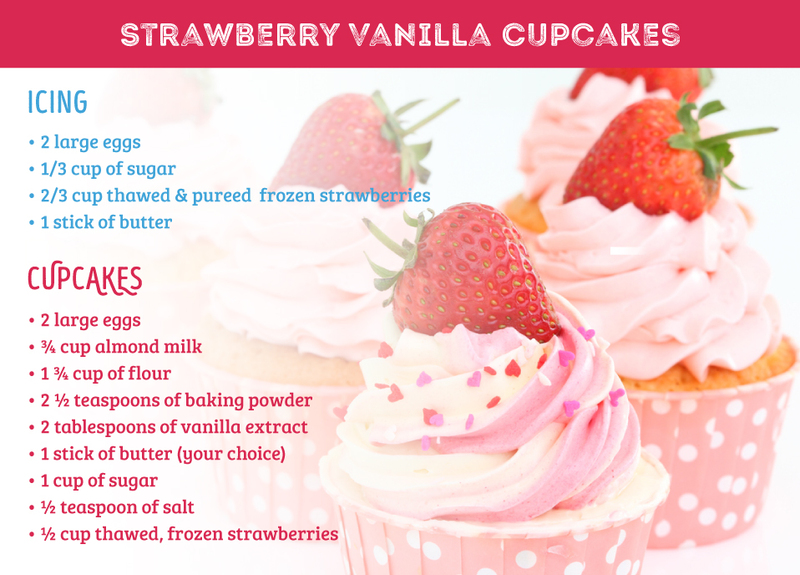 Strawberry cream frosting on top of simple vanilla cupcakes are an easy-yet-delicious way to impress guests. With real strawberries in the icing, we’ve taken the delicious factor to the next level, ensuring that seconds are definitely in order! To make the icing, whisk eggs together with sugar and strawberries in a large saucepan over medium heat. Stir until the mixture thickens, then remove from heat and set aside for a few minutes until cool. Transfer to a mixing bowl and add butter, beating with an electric mixer until the icing is a pale pink. Store in the fridge until cupcakes are ready. Next, preheat the oven to 350 degrees and grease a 12-count muffin tin with non-stick spray, or line with cupcake liners. In a mixing bowl, whisk together eggs, almond milk and vanilla. Then combine flour and baking powder in a separate bowl. Mix until thoroughly combined. In a separate bowl add butter, salt, strawberries and sugar and beat with an electric mixer until fluffy. Add the wet and dry ingredients little by little and mix until all ingredients have been evenly dispersed. Spoon mixture into the pans and place into the oven for 20 minutes, or until cakes have a springy consistency. Remove from heat and let cool for at least 30 minutes. Finally, remove the icing from your fridge and generously spread over the top of the cupcakes. Then, transfer to a serving platter and enjoy! Need some new cookware? Ceramcor offers a variety of cookware in vibrant colors that will perfectly complement whatever Easter feast you’ve got in store. Apple Green, Sky Blue, Sunlight Yellow — they all say “Spring Is Here!” and provide a high-quality cooking experience that’ll take you through the summer and into the years to come.